Since the visitors to the site have varying levels of play, I’m thinking of revamping the videos/animations for the flag football plays on this site. Instead of just showing the animation of the receivers, my plan is to add a defense (usually cover 2) and the reads/throws for the quarterback. Below is the first attempt at showing all this. Instead of asking for feedback through comments or emails, the easiest way to show if you like this video format is to press the Facebook Like button at the top of the page. This will help me in determining if I should rework the plays on this site. The purpose of the revised animation to show visually the options the quarterback can have. One key to success in flag football is reading the defense. With this play, the focus is on the cornerback. If he bails on the short route, then the quarterback hits Green for an easy 5-10 yards. If the cornerback sits on Green’s route, then Blue should be open on the corner route. 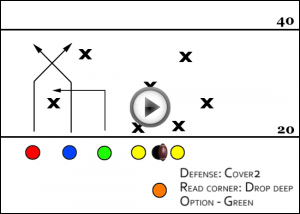 For some additional flag football plays, check out the free plays page.